Delicious rich choc cream filled biscuits. These combine two crunchy biscuits made with coconut, golden syrup and oats, joined together by a rich chocolate cream. 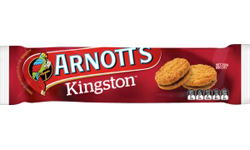 They have a distinctly homemade taste and texture making these a popular and tasty biscuit. Sugar, Compound Chocolate (23%) (Sugar, Milk Solids, Palm Oil, Cocoa Powder, Cocoa Mass, Emulsifiers (Soy Lecithin, E492, E476), Natural Flavour), Wheat Flour, Palm Oil, Desiccated Coconut, Oats, Golden Syrup, Baking Powder, Salt, Skim Milk Powder, Emulsifier (Soy Lecithin), Flavour, Antioxidants (E307 from Soy).